As Tim Gund says, "Make it work!" Specifically, I've been working on this bottom left corner. I've added paint to quite a few areas ... two blocks in particular. Copper metallic paint and a spiral stamp were used to add depth and definition to Patty's very yellow block pieces. Orange and green clips have been scattered across them as well. 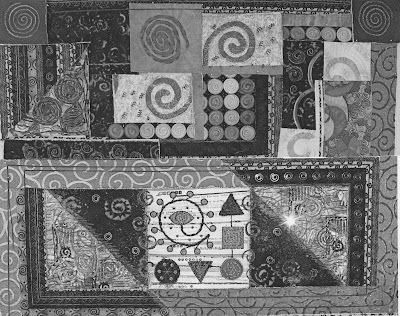 Sheila's block was a very strong graphic of bold spirals on a black and white background. The white attracted too much attention. Silver metallic paint lowered the value to "take it back" a bit. 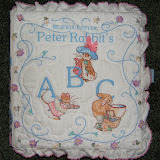 Paint was also added to Sheila's beautifully stitched quilting patterns within the spirals. 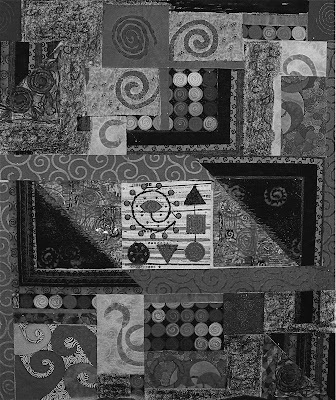 These ornate patterns are now evident and give this block additional visual texture to make it more in character with the rest of the quilt. Speaking of Sheila, this month we all made "floral fantasy" blocks for her. This is the one I made. Its size is ten inches square. Parts of different kinds of silk flowers are stacked to form fantasy ones. Scrunched up yellow silk thread make up the centers. A variegated rayon thread meanders across the background. Tulle netting holds everything together along with "scribble" machine quilting with the same rayon thread as well as quilting around the flower petals. The two PIF gifts of art that I owed Karoda and Deb were posted to them last week. 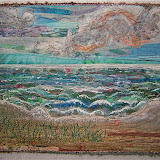 The original plan was to send them small collage lake quilts made from cut off trimmings from my ongoing lake series. However, only one lake piece has been made since early October and I didn't want to have to wait until next summer ... maybe even fall ... to fulfill my commitment. I made three mini quilts plus three postcards. 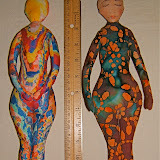 They all began in one long piece that was eight inches high the width of my craft table. After the last step of trapping the arranged orts with the tulle netting, I cut it into sections for the those six pieces much to my husband's dismay. He stood there saying, "NO, I want that. It's mine!" But then, he's said that about all 52 lake quilts that I've made. Sorry there's no photo. When I get engrossed or excited I tend to forget to take pictures. Well, now wouldn't you know that I have gotten myself committed to another PIF. I'm one of the first three to comment on Deb's blog where she has announced her PIF participation. I very much am looking forward to having a bit of her creativity in my life. Sooooo.... be one of the first three to leave a comment for me and you'll get a bit of mine in yours. I have an idea that involves the quilt about which I'm documenting the design process. 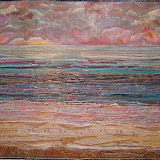 *During this series of making 100 larger lake quilts I've made several that are postcard size. I give them decimal point designations to fit them into the numbering system. Since all six of these follow Lake #52 they are numbers 52.1 thru 52.6. 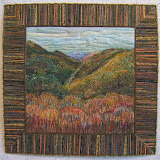 Susan Lenz got postcard 52.1 in our exchange. When the decision was made to document my designing process on line, I had not foreseen that this would be one of the most complex quilts I've ever created. The process started out as usual for me. 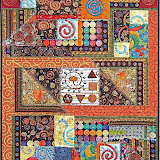 I put the 8 spiral blocks on the design wall and pulled coordinating fabrics from my stash. I intuitively positioned the blocks and began to see ways to transition between and connect them. I very much enjoy this "what if" part. The light and dark value placements balanced nicely. The distribution of the bright colors worked well. Then I messed up this good plan by mixing up the center blocks when I constructed the middle section. It took quite a few days for me to realize my mistake. In the meantime, I couldn't figure out why I was no longer happy with what I saw on the design board. I couldn't keep from "fiddling" with it and feeling antsy. It felt "off." Most of us have an intuitive sense of balance. We've had a lifetime of perceptual experience. We may not be able to put into words why an arrangement of objects, colors, or shapes does or doesn't balance, but we surely can recognize if it does or doesn't. Here are B&W photos of each arrangement. In the first organization the white square flanked with the medium value gold triangles combined to form a large shape in the middle of the quilt. The larger size of that focal point allowed for substantial sub units. I felt confidently well on my way at this point. The accidental grouping is the photo below. The white square is surrounded with the black triangles to make the center focus a much smaller shape. This switch threw the balance of sizes and values out of whack. The center of the quilt was fighting for attention. Here's a B&W photo of the final arrangement. I felt a need to break up the unit of three spirals that "played together" so nicely. They had overpowered the isolated white focus block. Now there's a good distribution of light, medium, and dark values that feel balanced within the whole. The top and bottom sections of the design support and enhance the center focal point rather than vying for attention. There are more nebulous background type blocks in the top section to give that area an impression of lighter weight. The greater number of defined spirals and shapes in the bottom one give more weight and stability to the composition. The center panel is made up of bold shapes and complex details plus the strong value contrast between the white and black. These combined factors add up to the most visual weight for the smallest area within the piece. It now balances with the top and bottom sections and reclaims the most attention. As much as I was satisfied with the first composition this one pleases me more. ... I'm involved in two others. One I cannot show any photos of nor write any descriptions about until it is finished next August. It's called "the Exquisite Corpse" and is the brainstorm of Arlee Barr, a mixed media artist from Canada. She's the leader of seventeen of us from various states and countries involved in this project. Arlee is also one of the artists participating in Susan Lenz's Cyber Fiber invitational exhibition next January. I wouldn't miss reading Arlee's blog with the almost daily revelations about her creative adventures and occasional stories about her job as a florist. Within the last couple of days Arlee was the featured artist profiled in Cyndi Lavin's "Layers Upon Layers" blog. The other round robin is between me and the young woman who I reconnected with last summer. She, along with her daughter and two other young girls spent a bit of creative time at our cottage. Go here to read about that fun time. Last fall Katrina wrote and asked if I'd be interested in participating in mail art with her. I consented and she suggested that we call it "mailort" since I like to work with scraps and her supplies are mostly scavanged from various sources. In early December she mailed this handkerchief that she's had for a long time. I cut a backing fabric and a piece of wool blanket for batting. I over-sized it so Katrina could decide how large this piece should be. A piece of hand-dyed cheese cloth that was gifted to me by Beverly of Fiberhart was layered over the bottom half of the hanky to give a definite water area. I then machine quilted around the motifs as well as the water and air. And then sent it back to Katrina in California. It came back with Katrina's additions this last week. The paper candy (?) wrappers are inspired. That repeating circular purple shape from the hanky filled with oriental writing is great ... let alone the texture and sheen of the paper plus variations on the basic rectangular shape of the whole piece. Then there's the red pompoms. We really needed those placed in those opposite corners to draw the eye upwards and then back down through the piece. And that couched green yarn floating in the air is great. The piece has been out where I could view it since it arrived in the mail. I thought I'd just look it over before going up to bed at 12AM the other night so I could "sleep on it." Well I got inspired, and finally retired at 1:30. I dug out cut wool strips that a rug hooking friend gave me and my supply of vegetable/fruit nets. I couldn't wait to get back in the studio the next morning to attach all that I'd arranged in place. Our biggest challenge is pulling the whole piece together. It surprised me that Katrina chose to use all of the space at the top. I hadn't given any thought to proportions when the foundations were cut ... I was just giving her an option of where the top should be. However, I think we're making it work ... that the two distinct sections of water and air are balancing and complementing each other ... even integrating. This mailort goes back to her on Monday. I can't wait to see what she does next. Now to get busy on the spiral block quilt. I'll be posting more about the design process and solution to my misplaced blocks soon. I got the lucky draw for this package from Jenclair of Bayou Quilts. She had made up a bunch of little hearts like the one clipped to this gift and asked for suggestions about how to use them. Everyone who posted one as a comment to this post was eligible. I'm the pleased recipient of this daily planner booklet with a linen cover that is hand embroidered. Also included are two delightful little bookmarks that feature photos from two of Jenclair's quilts. PS: The heart will get clipped to one of the shared art mobiles hanging in my studio. Between making valentines I added my bit to these two round robbin quilts. They are two of the Thursday Bee's (of Smoky Mountain Quilt Guild) contributions to the small quilt sale that will be part of our quilt show in mid-May. I wish I had remembered to take photos before I got going with fusing down the fussy cut critters and flowers. These are from the same print I cut critters for my grandchildren's valentines ... and what prompted me to get this task done. I've passed it onto Gloria along with four fussy cut butterflies that may be applied further out. I remembered to photograph this one before I couched the confetti-like yarn in the center of the sashings. I can't wait to see what more gets added to this one by Tone. Both of these had been worked on by two bee members before I got them. 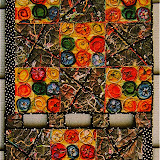 Pat had pieced all the blocks and Patty had assembled them into the two basic quilts. I've taken time out to make a bunch of valentines. These are the ones for my grandchildren. The note inside says something to the effect that I'm buggy about them. It's my custom to incorporate photos of each of them and me. Initially I had included photos because I didn't want them to forget what I looked like. It's difficult to maintain a personal connection with very young children when they don't see you on a regular basis. There's no chance they'll forget me now, but I won't break the tradition. Their valentines are always "playable". These are fabric collage under tulle and quilted, then sewn to card stock. ... and that it took almost a week to even see it! I reversed the position of my side blocks in the center section. I was so intent on keeping the elephants right-side-up and lost sight of my plan. The plan that so pleased me. All this week I've been changing everything around in the top section. Until late this afternoon I didn't have a clue why the initial arrangement wasn't working ... why I couldn't leave it alone. Aaargh! Well, that center section is not getting taken apart. I am satisfied with the arrangement as it hangs on the wall, but I can't believe what I did. Today is the due date for J.C.'s wonky house themed blocks from those of us in the SMQ Guild who are participating in this exchange. I created a village of Hudertwasser style houses for her. This is the fourth piece in my "Hundertwasser Happy Houses" series. It is made in my "ortwork" collage technique. However, the ground, sky, and house fabrics are not cut from scraps (orts), but the rest were rummaged from the three big bags sitting in my studio. To read about the other three H.H.H. quilts go here. And here's another block I had made in November for this group exchange. Sandy's request was for cowboys. The cowboys and some hats from the heads of others were cut from fabric I had found in an antique store in Colorado last summer. I don't believe the fabric is old, but it's the only place I've ever seen it. I fused the cutouts onto a background fabric that looked like swirling ropes or lassos to me. The black outline around the shapes is satin stitching. Next month Sheila gets her "floral fantasy" blocks. Hmmmmm... wonder how I'm going to interpret that one. PS: Several of you have expressed concern for me in the terrible storms that hit Tennessee. The tornadoes didn't get to the east side of the state were I live. We just experienced strong winds and torrential downpours. My prayers are with those who lost loved ones and homes. My PIF gift from Acey arrived in today's mail. It is wonderful! I keep looking at it and discovering ... more. I love the reflected sunlight within it and the sparkle of dew. Is it early morning OR has the sun just come out after a mid-day sprinkle? Whichever one will depend on the kind of day it is OR the kind of day I'm having. I'm pleased to have this piece of her creative energy in my studio. Also, in todays mail was a postcard. 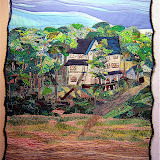 It is created by fiber artist Susan Lenz. It's part of the postcard exchange for her upcoming international Cyber Fyber Exhibition scheduled January 8 - 20, 2009 at Gallery 80808/Vista Studios, 808 Lady Street in downtown Columbia, South Carolina. In exchange, this is the one I'm sending to her. And then there's the little purple guy that I brought home from Chicago after the holidays. Our 6-year old granddaughter created this charming creature for me. It hangs with the drawing of a sewing machine by a grandson, my latest award ribbons, and the little old soft sculpture guy who keeps watch over all. My studio is full of creative energy. This quilt is divided into three sections. It "happened" that way because there were two blocks that were so different from the all the others. 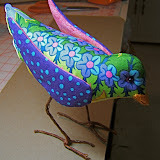 They were embellished with beads and had metallic and silk fabrics. I made two flanking blocks by cutting the one diagonally and adding the black discharged linen fabric to complete them. They dictated that they belonged together and had a story to tell ... and were to be the focus of this quilt. The other blocks would just have to find their places above or below them. To figure out a dimension for additional parts in a quilt I use a measurement that is already there. I've concentrated on sewing the center panel of this spiral quilt together so I would know exactly how wide the quilt would be with the piecing I had planned. That section is 48" wide and 18" high. The common denominator in this dimension is 3 ... each of those numbers can be divided by 3. Then I got out my graph paper to figure out my vertical divisions of space. I can more easily count out and see what's going on by drawing quilt dimensions on squares. In this drawing one square equals 3". The top section was laid out on my design board with the premise that it would be deeper than the center one. All the while I had in mind that the bottom one would be the deepest of all. So thinking in terms of 3, I added 3" to the 18" depth of the center section to come up with 21" deep for the top one. Guess what the depth of the top section on my design wall measured? It was 21 inches! Hmmmmm.... a strong clue that I was definitely on the right track since my intuitive sense of proportions had already figured out that dimension. To make that bottom section the widest, but in proportion with the other two I added 6" (2 x 3) to the center panel's 18" to come up with a 24" depth. All three depth dimensions added up to 63". The proportion of 48" wide to 63" high looks and "feels" right to me. I drew out those proportions and dimensions on tracing paper and played with it a bit just to make sure. The left side is a tracing of what I had drawn on the graph paper. On the right side I centered the middle section making the top and bottoms ones equal in depth. They're deeper than the middle one which gives a touch of variety. This arrangement is definitely balanced ... too balanced for my taste ... a bit boring and predictable even though it has more interest than if all three sections were the same size. I still liked the layout on the left best. 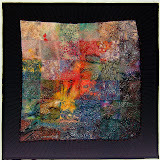 The largest section at the bottom anchors all the busy energy in this quilt. It is unusual for the center of attention to occupy the smallest area. 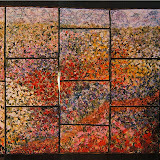 What makes it appropriate for this composition is that it is made up of the three largest blocks. Plus they gain even more importance by being set off with a definite frame. It also has a different feel or character from the top and bottom sections. The next time you see a picture of this quilt there will be no open spaces. I'm still fiddling with that area in the upper left corner and I have a good idea how to fill the lower right.